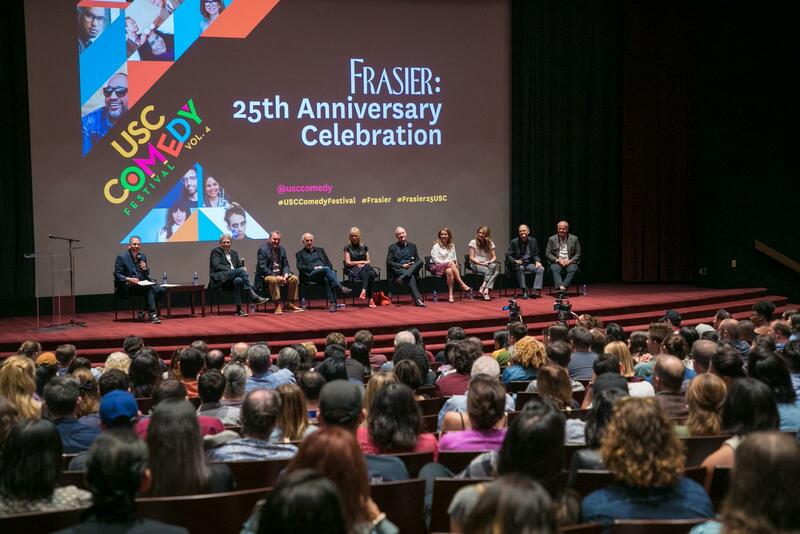 The Frasier: 25th Anniversary Celebration was easily the most popular event of the fourth edition of USC Comedy Festival, which was held over the weekend of Nov 2nd to 4th. 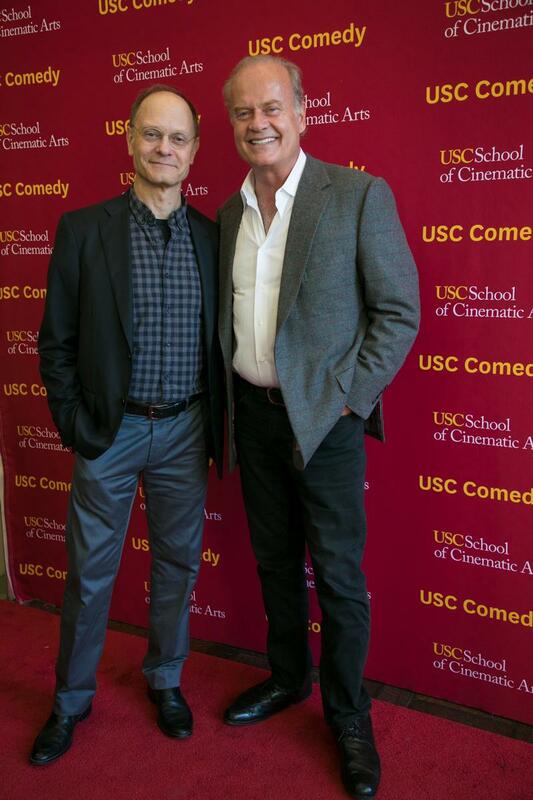 Held on Saturday, November 3rdin the Eileen Norris Cinema Theater, the afternoon was a reunion of the cast and creators of the hit sitcom which ran on NBC for 11 years (1993–2004). 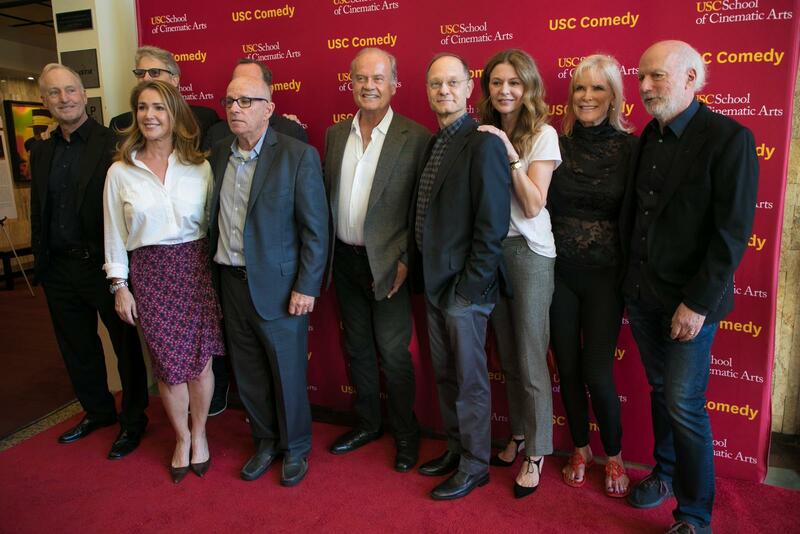 Cast members Kelsey Grammar, David Hyde Pierce, Peri Gilpin and Jane Leeves were joined on a panel with show creators Peter Casey and David Lee, longtime writers and producers Anne Flett and Joe Keenan, and legendary television director James Burrows. In the audience were an additional dozen or so collaborators who were instrumental to the show’s success. Surrounded by family, co-workers, fans and students, the afternoon event was a standing-room-only reunion and celebration of the 25th anniversary of the show’s premiere season. The panel was moderated by Bill Prady, co-creator of the hit sitcom The Big Bang Theory. Following a montage of clips from the show’s pilot, as well as various other classic moments, the panelists told stories of show’s creation and impact, sharing favorite behind the scenes anecdotes with an appreciative audience. According to Grammer, the ball began rolling back when he was playing Frasier Crane on the show Cheers. Towards the end of the show’s run, Grammer said, he was informed that Paramount wanted to make him a leading man, although initially the plan was to do a show with no relation to Cheers. “About three years before Cheers ended, Paramount said they wanted to do another show whenever Ted (Danson) said Cheers was over. A year later we ended up with Fraizer,” Grammer recalled. Casey and Lee took some time to discuss what they and writers of the show did to step out of the shadow of Cheers, detailing the struggle of creating a sequel to a beloved series. They noted they set the series in Seattle, as far away from Boston (where Cheers was set) as they could get. Even the now iconic use of title cards between scenes, instead of the usual music, was seen as a way to differentiate the new show. Writers Flett and Keenan discussed the show’s embrace of farce in some of its scripts. Keenan was specifically singled out for his skills in being able to complete the often difficult task of writing farcical scripts. When it came time for the Q&A portion of the afternoon, the first, and seemingly most popular question was regarding a potential reboot of the series. Grammer acknowledged discussions of a reboot but quickly added: “There’s been no premise that has come along that has the necessary fire.” He noted the difficulty of recapturing something great that happened two decades ago, adding that an attempt at doing so would require a legitimate idea for a third act for Frasier Crane and company. The evening ended with the announcement that a scholarship from the Jack Oakie and Victoria Horne Oakie Foundation would be named in honor of the 25th anniversary of the series, and would be awarded to a School of Cinematic Arts student next year.